At Thomas & George Martin Violin Makers we pride ourselves in offering our clients friendly and knowledgeable service. If you are looking to buy an old double bass, we are perfectly placed to assist. We are specialists in certifying and valuing fine double basses, and help ensure any instrument you are considering is right for you and your finances. We do stock a good selection of quality old double basses ourselves, as well as a number of high quality new instruments. Our workshop team is highly skilled and experienced, and can deal with everything from the smallest adjustment up to a complex restoration. With an extensive selection of the finest old double basses, and a series of well-designed new instruments, we have something to suit every player. We pride ourselves on our reputation for helping our clients find the instrument for them. As double basses and bows have appreciated greatly in value in recent years, the need for certainty in an instrument’s authenticity has become vital. A Thomas & George Martin certificate of authenticity provides peace of mind that an instrument is genuine, and your investment is protected. No job is too big or too small for our workshop team of double bass specialists. The smallest set-up adjustment can have a profound effect on an instrument. We are happy to discuss any repairs or restoration projects without obligation, so please feel free to get in touch or arrange to visit us. Our expertise means that a significant aspect of our work is providing appraisals for double basses and bows. Having the right certification to accompany a double bass or bow has become increasingly important in the international marketplace. Knowing where an instrument's value sits is just as important. A full range of supporting services is on offer including valuation, authentication and certification. From a minor set-up adjustment through to a major restoration, our experienced workshop team has the skill to undertake anything relating to the health and wellbeing of a double bass. The workshop is situated in the beautiful English village of Williamscot, in North Oxfordshire. It provides a delightful environment for us to work on these wonderful instruments, and is also a place our clients enjoy visiting. Finding the right instrument is a journey for any musician and is something that we have been privileged to be involved with many times. Over the years, we have partnered many players with their perfect double bass, often helping to acquire a specific instrument that is off the market. To see more videos like this, please visit our videos page, which features a number of fine instruments captured on camera. We have had the honour of supplying many wonderful double basses, both old and new, to players all over the world. Many of our clients remain in regular contact with us and become friends. We love hearing about the journey their instrument has taken them on. Tom Martin and Martin Lawrence first worked together on a series of double bass articles for The Strad, and the idea of producing a book focusing on the English double bass came soon after. With George Martin becoming heavily involved in the family business, the first in a series of double bass books was published in 2018 to critical acclaim. 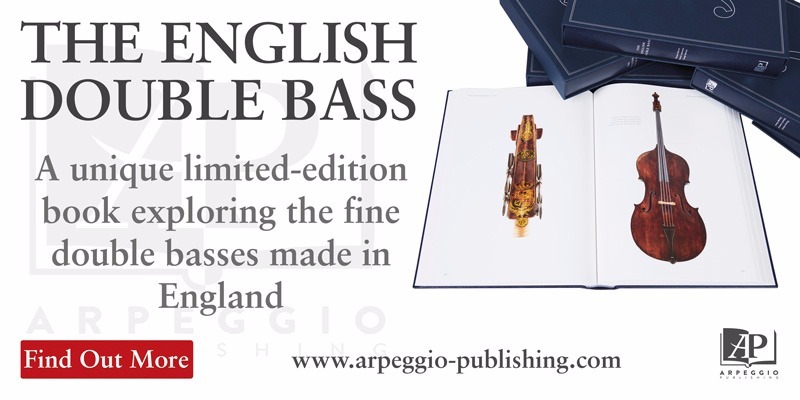 Following this success, the next instalment in the series, The Italian Double Bass, is currently underway, with its release due in 2020. Thomas Martin has long been a household name in the double bass world, gaining recognition for the series of recordings he produced featuring the music of Bottesini. Tom has gained a reputation as a world-class teacher of the double bass and many of his students hold top orchestral positions. Today he still performs and teaches while working together with his son George on authenticating and placing double basses.